Owner Stuyvesant Wainwright helms CARA MIA in early competition against NAUTILUS and NEOLA II. 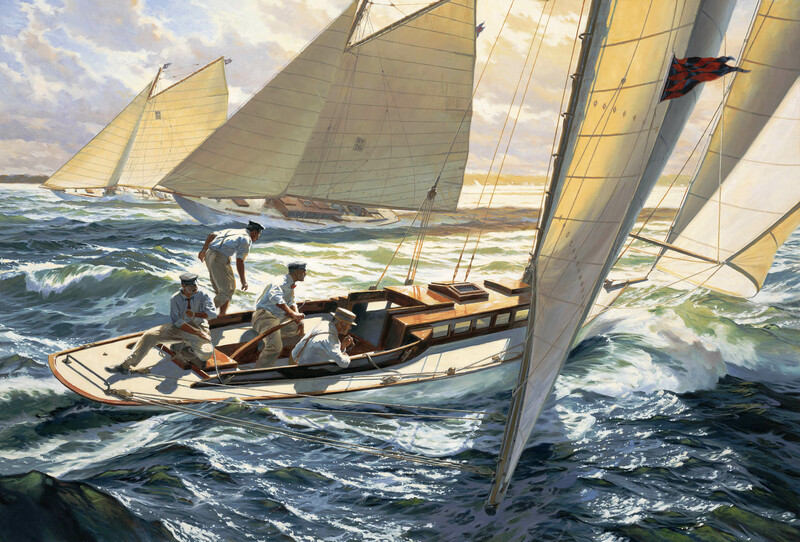 Eighteen New York 30s were built by Herreshoff in 1905, and became instant classics. Several have been lovingly restored and campaign to this day. CARA MIA was the overall winner in her inaugural season of 1905. Russ Kramer writes: I was lucky enough to have been asked to crew on CARA MIA in her 2008 shakedown cruise from Mystic to Newport, and, needless to say, it is the best and most enjoyable day of research one can imagine. The title is a homage to the great Carl G. Evers, who’s painting of the same name inspired me as a teenager to want to someday become a marine artist. This original oil won an Award of Excellence at the 2008 Mystic International Marine Art Exhibition and was sold into private collection.